When I started thinking about rest, I had this vision in my head of a spectrum where rest was at one end and productivity was at the other. That made sense to me. You were either working hard or you were resting. I realize now that I had it wrong. 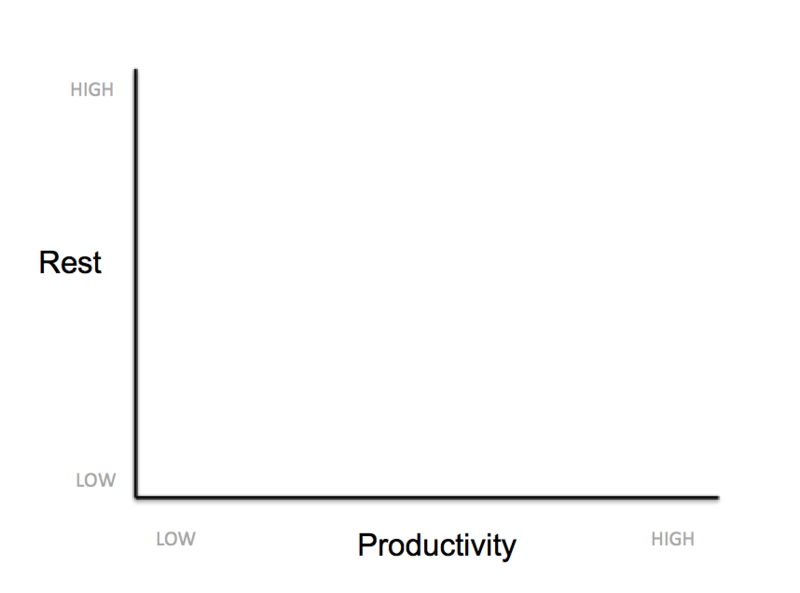 Rest & productivity are two separate axis, like this. All things we can do with your time fall somewhere in this space. But before I can talk more about how we can & should spend our time, I need to define the terms. Productivity: That which fulfills your purpose or helps you get closer to it. I had a limited view of this term when I started thinking about it. I was thinking of productive as synonymous with efficient – getting a lot done – but this is in fact a huge misconception. You could be getting a lot done or be very busy but not at all productive. Productivity is doing those things that are help you complete your life purpose. The nice thing is that what you define as productive will be determined by how you define your life purpose. If your goal was to reduce humanity’s use of oil, anything you did that got us closer to using less oil would be productive, like founding an electric car company. Some things you could do wouldn’t be directly in line with that purpose but might help you have a better chance at succeeding later on, like getting an MBA. In that sense, getting an MBA is somewhat productive, though you introduce uncertainty as you remove yourself one step from your purpose. You can have multiple facets to your purpose, and as such, there will be many different things that are productive for you. Rest: That which recharges a facet of your being. My view on rest tended to focus on physical rest. But other rest is important to. I realized that many things that are exhausting physically are actually fairly restful mentally – like going for a run after work. Since there are many parts of you (physical, mental, social, emotional, spiritual), there will be many different ways you can rest. Now, you can make an argument that rest is productive because it is necessary to do anything else. 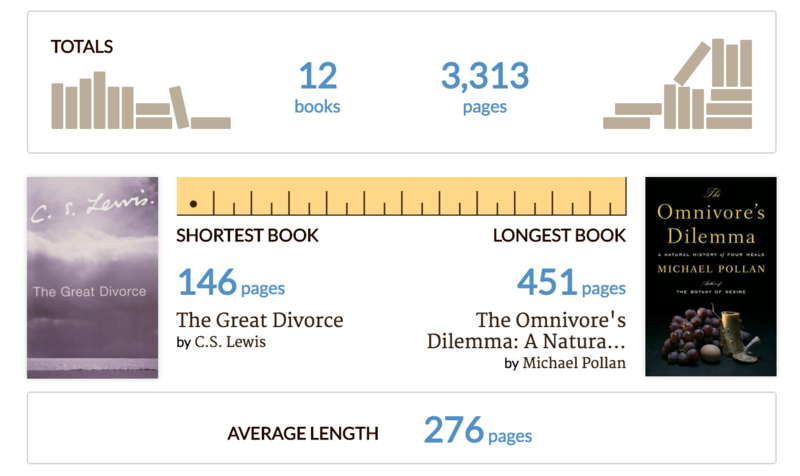 But that is sort of the macro point of my year. If I rested enough I wouldn’t need to spend a year thinking about rest. Since I don’t naturally tend to rest enough, I’m thinking about it as a distinct item here. Back to our grid of productivity and rest. 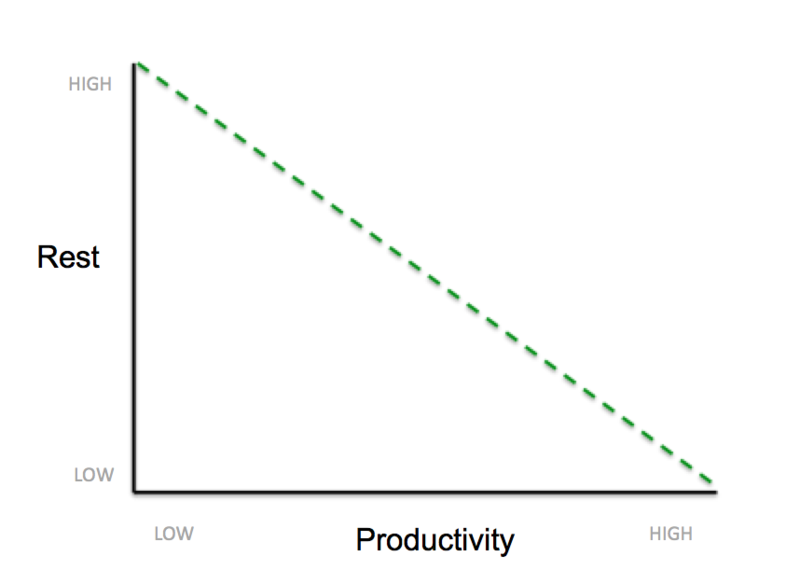 We can imagine a line running from high-rest low-productivity all the way to low-rest high-productivity. If we plotted every way we spend our time, our goal would be to be on or above this line. 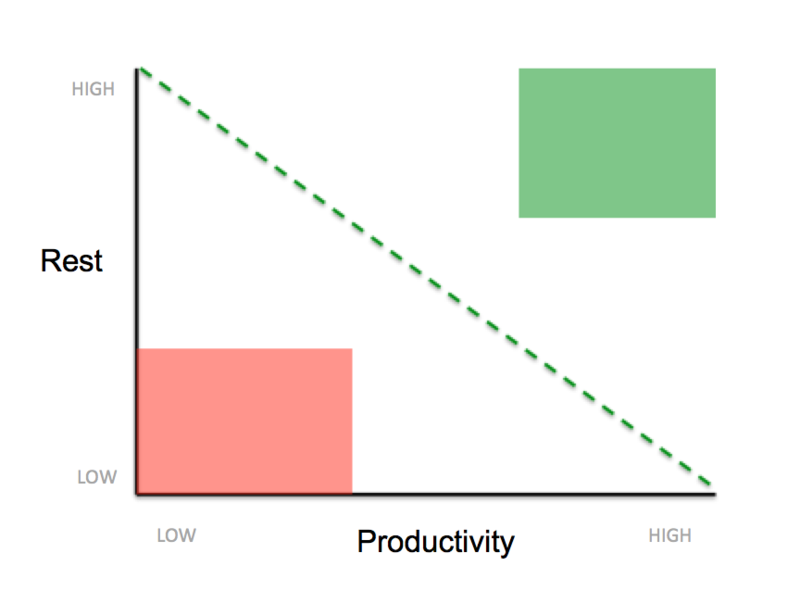 We generally know that being productive takes work and that is often exhausting – but that is the trade off we make. We also know that we need rest, and that we’re often not productive when resting – though I’d love to hear about anyone that has figured out a way to get work done while asleep. But everything we do won’t fall exactly on that line. Some things will veer off of it. Two particular areas that I realized I needed to be aware of are high-high & low-low. That area in the top right that is green is the sweet spot. If you can ever find something that is highly productive & highly restful, you should probably spend as much of your life as possible doing that. 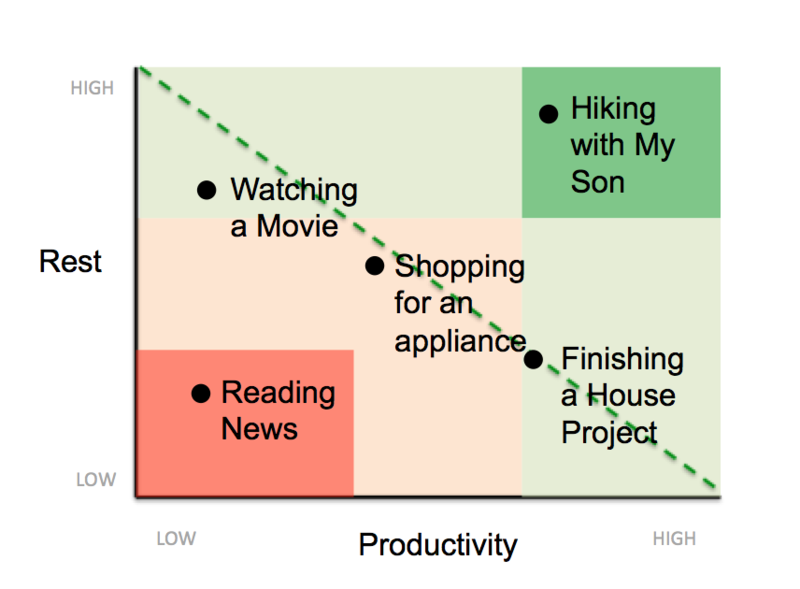 On the opposite side, there is that red box of low productivity & low rest. If you ever find yourself doing something like that, you are not getting sufficient value for your time. Filling out the rest of the space, anything that is close to or above the line is probably a decent way to spend your time. Colored light green here. Anything below the line is probably not a great use of your time. Marked in light orange here. Now you’ll notice that I marked the middle area as light orange, meaning it isn’t the best use of time. This goes back to a post I wrote on increasing variance. 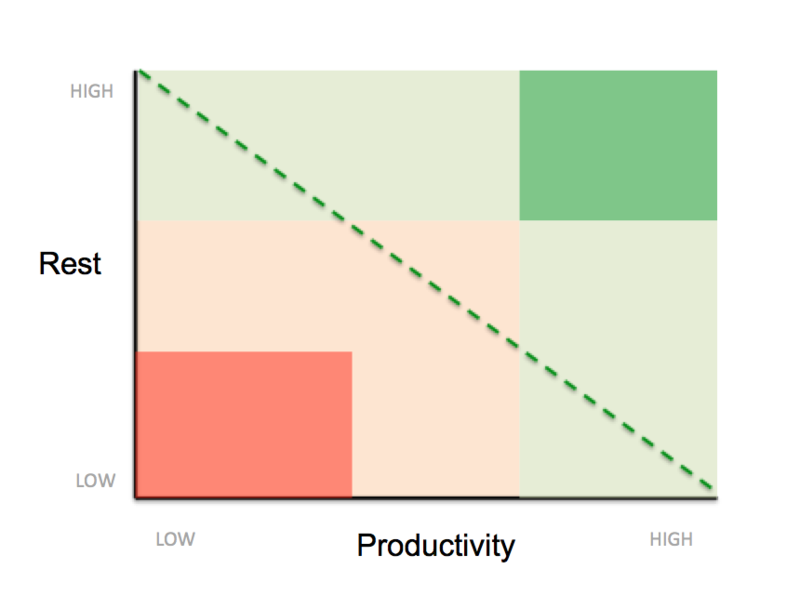 I think that spending too much time at mid range restfulness & productivity isn’t a good idea. It is monotonous. I think we’re much better off by having bursts of high productivity, followed by periods of rest. Fertile land is that which gets rain for part of the year and sun for another part. Now that we have a way to think about how we spend our time, what does it look like to put that into practice? Here are a few examples I came up with. The first is a very basic example of what an animal or early human probably experienced. The simple life. 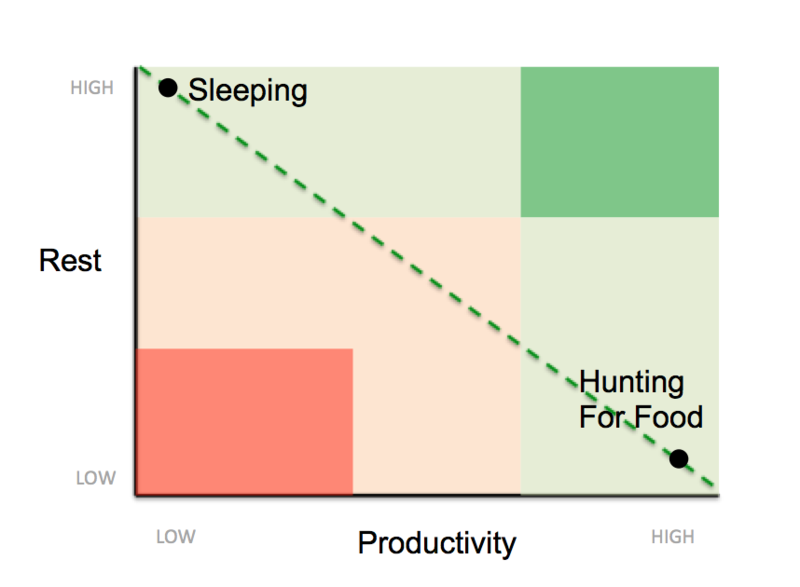 You are either hunting for food or sleeping. One is necessary for your survival and the other is necessary to recharge so you can repeat the process. We’ve of course complicated things, so here is another example, this is how I see some of the things I might do on the weekend. In the sweet spot you’ll see ‘hiking with my son’. As a parent, I’ve decided that raising a family is one of my life purposes, so any quality or quantity time I spend with my children is productive. 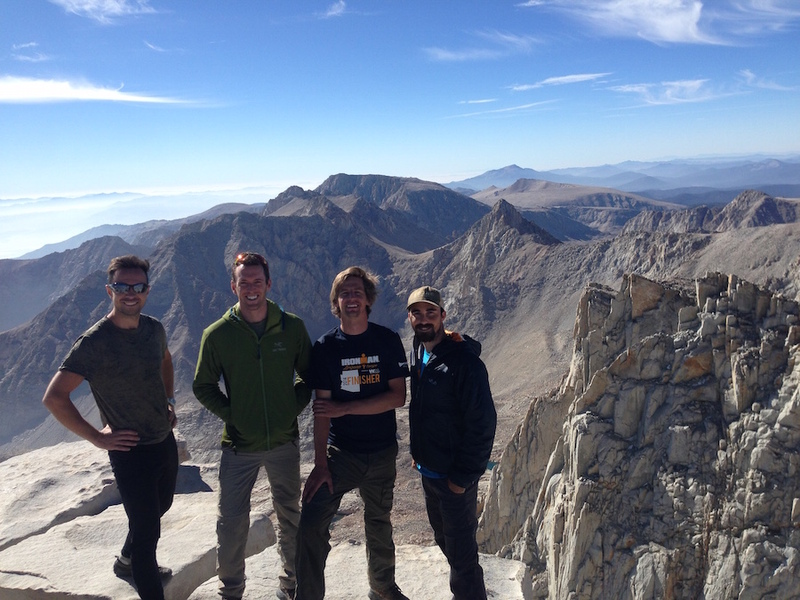 Hiking, though physically exhausting, is one things I’ve found to be very restful for me. Being outdoors helps my mind calm down. As such, being outdoors with my son is one of the best uses I’ve found of my time. At the far opposite side you will see ‘Reading the News’ which could really be a whole lot of other time wasting internet reading that I often get sucked into. It isn’t helping me with anything and it isn’t particularly restful, as noted by my eventual physical & mental exhaustion after doing so for a while. 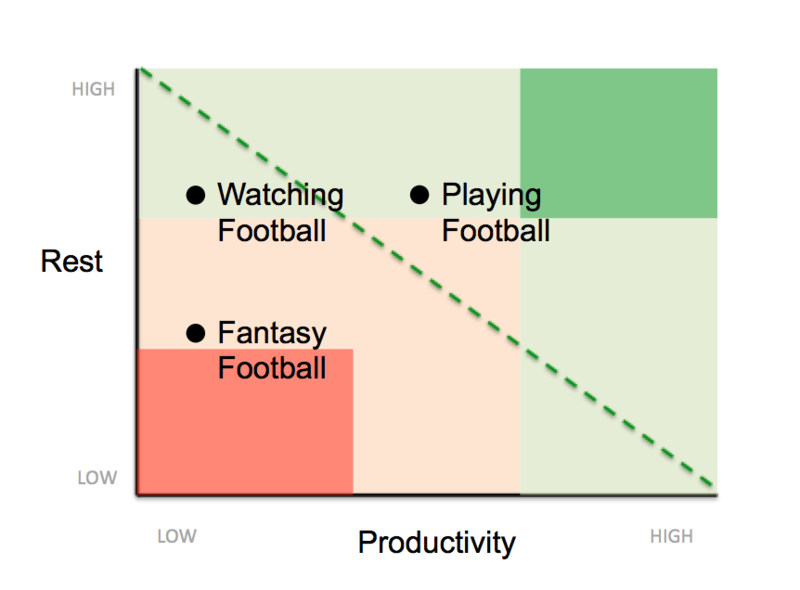 Here is another example – this one is about football. I love football, and it takes form in my life in many different ways. Not all are equal however. Playing football for me is mid-level productive for a few reasons. First, it is good exercise, and being healthy is one thing that is core to my purpose. Having a strong body allows you to do much more, both in terms of experiences and in terms of freedom from illness and setbacks that would detract from your purpose. Second, playing football is somewhat social – which is a large part of my purpose. Watching football on the other hand, is sometimes social, but not physical. The social aspect is usually somewhat shallow as well. I have it as low productivity but high rest. The reason it isn’t more restful is that watching games can actually be overstimulating – there is a lot going on. Additionally, watching the team I root for, the Atlanta Falcons, hasn’t been very restful the past few years as the team has been doing quite poorly. Finally is Fantasy Football. Everyone’s experience with fantasy football is different, but for me it isn’t very restful. I am extremely competitive so I end up spending a lot of time trying to arbitrage the market by predicting injuries and picking up players on speculation and then attempting to trade them. It is fun, but in a very hard work kind of way. The big issue is that it is hard work that is not at all helping me towards my life purpose. Now that I have a model, there are a few things I would like to do. One is to codify in a bit more detail my purpose, so that I can accurately measure things in relation to it. Another is to document activities and get data to verify how productive and restful they are. Once I do this, I think this model will help as I look at how I spend my time. It should give me something more concrete to use when applying value claims to that data which I’ve been collecting for almost a decade but not yet found a ton of use for.